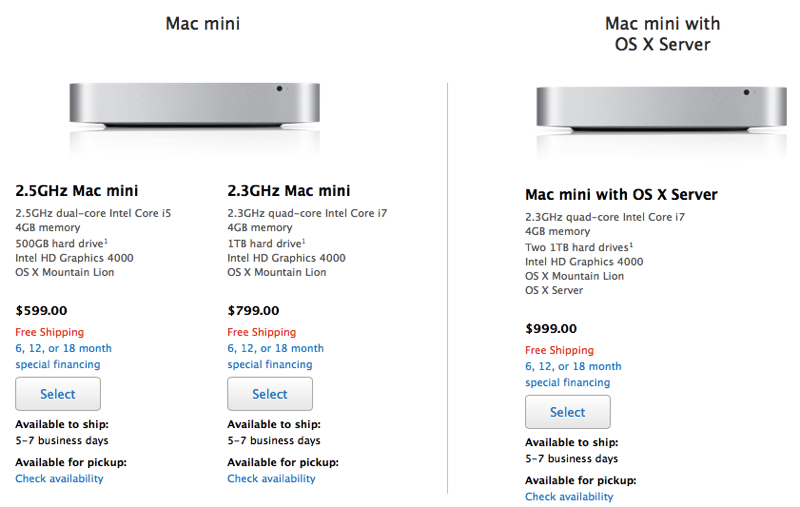 Mac Mini Shipping Times Slip to 5-7 Days on Apple Online Stores, Possible Refresh Ahead? Ahead of a "very busy fall" for Apple, Mac mini ship times on many Apple Online Stores have slipped to 5-7 business days. All other Macs on the online store have shipping estimates of "within 24 hours". That said, most Apple Retail Stores do show availability for the mini, as does Amazon.com. Apple sometimes does have temporary product shortages of computers mid-cycle, but they can also portend intentional drawdowns of stock ahead of a product refresh. The Mac mini is a candidate for an upgrade to Haswell processors, and it is coming due for a possible update according to the MacRumors Buyer's Guide. Maybe the new Mac mini will be a shiny black donut. Oh, goodie!! Safari will be much snappier on these new Haswell Mac Minis. I have to get one of these models before they kill Firewire! Haswell i7 with Intel Iris Pro 5200, and I'll have one in my office as soon as their out.